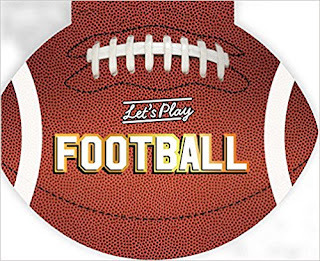 It's down to the fundamentals in Little Simon's Let's Play Football (Little Simon books, 2017), with a shaped book whose cover has the texture of pigskin and whose laces feel downright real. Inside, the Little Simon editors begin with the ball and uniformed players in helmets and protective gear and then head out on the football field, the familiar gridiron with its ten-yard markers and its upright goal posts through which the kicker hopes to send his ball soaring. The two opposing teams are introduced, along with their offensive and defensive squads and what plays and skills each player's position requires, from blocking to running, to passing (throwing), to receiving (catching) the pass. And not to be ignored, the reader is introduced to the officials, equipped with their mighty whistles and penalty flags, to enforce the rules!